WASHINGTON: A man jumped the perimeter fence of the White House on Thursday, jangling nerves on the 13th anniversary of the September 11 attacks. Witnesses said he was quickly apprehended by two armed Secret Service officers who had scrambled to intercept him. A Secret Service spokesman said the man, who was not named, was taken into custody. The White House complex, as is standard procedure in such incidents — which are common — was locked down and people were prevented from entering and leaving the grounds. 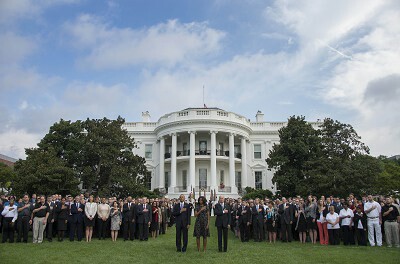 US President Barack Obama was not at home at the time because he was taking part in an event elsewhere in Washington to mark the anniversary of the 2001 attacks.